Many of these employ similar plotlines, but it’s tough to say who came up with the formula. Though Shakespeare forged a template in some early comedies, surely Jane Austen holds the patent. At first, the guy and girl don’t like each other much. Before long, one has a change of heart and staunchly goes “a-wooing” (usually the man). Meanwhile, an unworthy rival zeroes in on one of the two (usually the woman). Nonetheless, love seems to be moving forward for the pair—when suddenly, some outside obstacle intrudes to force them apart. At the same time, a second couple falls more easily in love, generally resolving their problems first, and paving the way for two happy unions at the end. In Austen, these elements appear in Elizabeth and Darcy; in the sketchy wooer, George Wickham; in the threat of scandal from Lydia; and in Jane and Bingley, whose love points the way to a joyous resolution. No doubt the best screen version of P&P is a sprawling 1995 miniseries with Colin Firth and Jennifer Ehle. At 300 minutes, it requires a meal-break along the way—but it’s almost as good as the book. Folks who want something shorter can’t go wrong with the 2005 feature film starring Keira Knightley, Matthew Macfadyen, Rosamund Pike, Carey Mulligan, and Donald Sutherland. A very funny love story with nearly all of Austen’s standard elements. Will Smith plays a relationship guru pursuing Eva Mendes through a series of obstacles, while Kevin James is uproarious as half the secondary couple—a likable oaf who fumbles his way toward romance with Amber Valletta. Also comical is this Harrison Ford/Anne Heche vehicle directed by the reliable Ivan Reitman (Dave, Ghostbusters). It’s a sunlit, suspenseful sleeper that strands its squabbling couple on a desert island where they try not to fall in love, because Heche’s character is newly engaged. This swashbuckling cult-fave doesn’t have a secondary couple—and it moves the “don’t like each other” motif to mid-film. Still, it’s got a love-to-hate rival in the wretched Prince Humperdinck, plus obstacles galore as our hero (Cary Elwes) works to save his love (Robin Wright) from pirates, kidnappers, and a “fire swamp”—not to mention the Rodents of Unusual Size. Funny and exciting fare from director Rob Reiner, with an excellent score by Dire Straits’ Mark Knopfler. Co-starring Billy Crystal, Carol Kane, Mandy Patinkin, Wallace Shawn, Fred Savage, Peter Falk, and Andre the Giant. Among these, Beauty and the Beast clearly frontlines the initial dislike, the obstacles, and the unworthy rival. I love both the 1991 and 2017 versions—though fans might also want to seek out the visually stunning black-and-white rendition from French director Jean Cocteau (1946). My other pick in the cartoon category might surprise some: Pixar’s WALL-E, a fiendishly clever sci-fi story about—robots! Yes, it does have a human background couple (voiced by John Ratzenberger and Kathy Najimy), but I love how the hard-driven Eva finally wants nothing more than to get the title character fixed and functional. Without that loving motive of hers, the starship Axiom would still be floating somewhere in space. Both the 1993 and 2012 versions of Much Ado About Nothing are splendid. What’s that? You say you’ve never even heard of the more recent one? Of course, the earlier movie, directed by the peerless Kenneth Branagh, is funny and sunny with a terrific cast that includes Branagh, Denzel Washington, Keanu Reeves, Kate Beckinsale, Emma Thompson, and Michael Keaton. But the later, lesser-known installment is equally terrific. It was made as a breather by big-budget expert Joss Whedon (The Avengers)—who filmed it in black and white on his own estate—in a mere twelve days. But wow, is it funny. And romantic! Shakespeare purists might puzzle over my final choice: the 1999 teen comedy 10 Things I Hate About You, loosely based on The Taming of the Shrew. It’s fairly foul-mouthed—in a boys’ locker-room sort of way—but also uproarious, with an ending that subtly indicts premature promiscuity. The strong cast includes Julia Stiles, Heath Ledger, Joseph Gordon-Levitt, Larry Miller, David Krumholtz, and Allison Janney. At this point, some readers may be wondering if there are any worthwhile cinematic love stories that don’t follow the usual rom-com formula. Here are five other favorites that break the mold. This classic from director John Huston puts Humphrey Bogart, a hard-drinking boatman, and Katharine Hepburn, a prissy schoolmarm, alone together on a jungle river in World War I. The two fall clumsily in love while battling bugs, rapids, leeches, and gun-toting Germans. 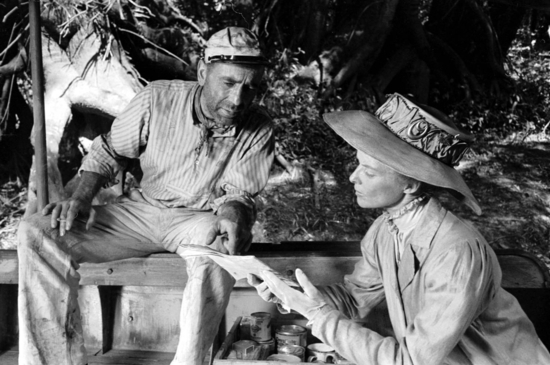 With a script by James Agee from C. S. Forester’s novel, The African Queen is of those rare films that’s actually better than the book—way better. An unjustly neglected delight from director George Roy Hill (The Sting, Butch Cassidy & the Sundance Kid), A Little Romance is about two super-smart preteens who fall in love one summer in Paris. It was the career debut for the lovely and talented Diane Lane (Secretariat, Unfaithful, Lonesome Dove). Though she was only 13, Lane’s winsome work elicited praise from her co-star, Laurence Olivier—and landed her on the cover of Time magazine. (Olivier had dubbed her “the new Grace Kelly.”) Boy, I wish more people knew about this movie! In this zany screwball comedy from madcap master Preston Sturges (The Lady Eve), you’ll meet Joel McCrea and Claudette Colbert as a husband and wife who think they’re not in love anymore; Rudy Vallee as a spendthrift millionaire; Mary Astor as Vallee’s sister (who is incessantly plagued by her witless protégé, Toto); the trigger-happy Ale & Quail club, featured in a raucous railcar sequence; and Robert Dudley as “the Wienie King” (“Stay away from em—you’ll live longer!”). I know, I know—another odd choice. But note how every single apartment in the film represents a future possibility for the rocky relationship between protagonist James Stewart and his society gal, Grace Kelly. Those possibilities include the man across the way, who seems to have murdered his nagging wife. Fortunately, as Kelly helps her immobilized lover investigate the couple, we can see that she and Stewart won’t share their fate, or that of Miss Lonelyhearts, or the bachelor pianist. Rear Window is Alfred Hitchcock’s first true masterpiece, a virtually perfect film that still holds up after more than sixty years. “A kiss is just a kiss…”—that is, unless it’s between Bogart and Bergman in this most beloved Hollywood romance. 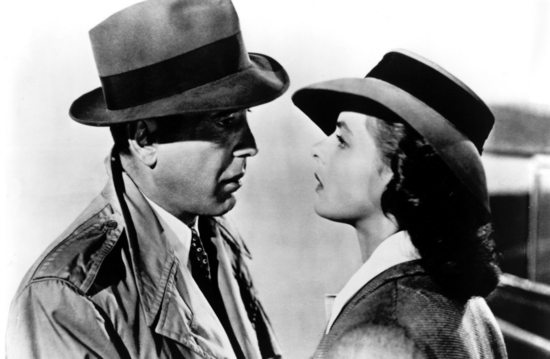 Winner of three Oscars (including Best Picture), Casablanca is ranked number one on the American Film Institute’s list of “Greatest Love Stories”; and six of its lines landed on AFI’s 100 Great Movie Quotes—twice as many as any other movie. Casablanca is funny, romantic, well acted, cleverly scripted, and beautifully filmed, but its triumph is a stirring portrait of one man sacrificing his hopes and dreams for the woman he loves. If you’ve never seen this, give it try; it might be the beginning of a beautiful friendship. Joseph W. Smith III is a writer and speaker in Central Pennsylvania. His book Transparency is available at his website—josephwsmithiii.com—and through Amazon.